I first encountered the fortress towers of Danba in the winter of 2016. It was February, there was snow to be found on the ground and it was chilly. Any leaves that were able had fallen from the trees and the skies were clear and blue. Visibility was excellent! 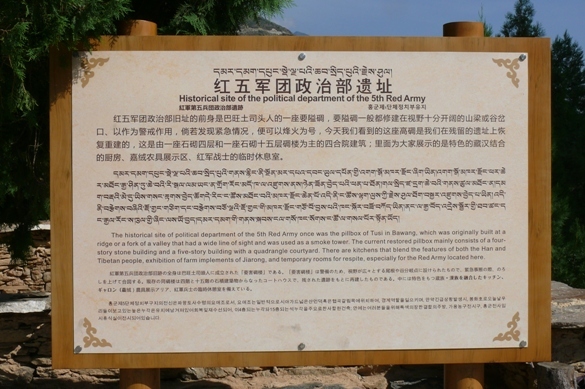 I had read a sparse amount about the watchtowers of the Gyalrong Valley but the references were only in passing and did not provide much information to satisfy a retired Army officer looking at things from a military perspective. My guide was helpful but also lacking in any depth of knowledge about the Qiang people and their customs and history - probably because he was from the Amdo region and was not of Aba or Kham-area descendants. From the viewing area I had looked north toward Suopo town and the sweeping landscape of towers beyond. As my eyes had become accustomed to light and shadows and the various shades of grey-brown, I was able to see 12 – 13 towers across the river; no, wait … I could see 16, then 17 …. 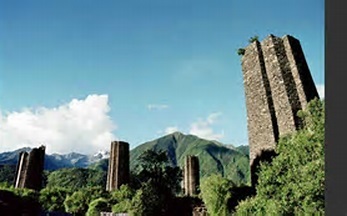 Later, when scouring many photographs taken of the area I could determine that there were at least 29 towers in this area north of Suopo town. And from Suopo town looking south back across the river, I had been able to see another 24 towers. Carefully scanning my photographs looking south across the river, I was also able to determine the probable location of one of the most intricate and largest towers of them all – the unique 26-side 13-point fortress tower of Danba. 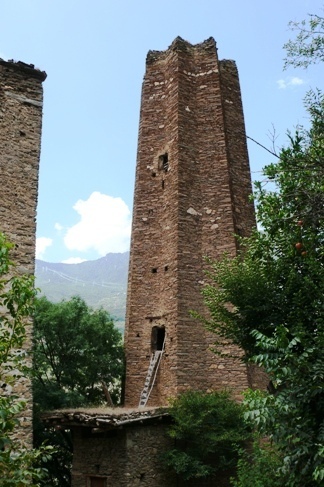 If there were only about 200 towers remaining and 50-60 of them were in the Suopo town area of the Gyalrong Valley, and if one of them was the largest of them all, then this was a treasure trove of information and needed a return visit. I had to return – and I did! The geography of the Gyalrong Valley is harsh, with fast flowing water forcing its way down a steep walled fjiord-like valley forest. Some old growth remains but in many areas avalanche zones triggered by either snow or earthquakes (common to the area) have uprooted trees and sent them sliding down to the river creating obstacles to movement in this narrow corridor. Movement up or down the valley was constricted to a track alongside the river, and it was this route that was plied by tea traders and others for centuries. This was also the route used by Emperor Qian Long in the 18th century during his two campaigns to subdue the local king and squash the last remaining stronghold of the Bon religion. To ensure success for the second campaign, Qian Long had more than 60 towers built in the Western Hills area of Beijing to train his troops how to attack and defeat them. The final campaign in the Jinchuan wars lasted ten years and, while successful, severely depleted the Imperial treasury in Beijing. The forces of Mao Tsedong also used this route when liberating the Gyalrong area of China in 1948 /49 with the 5th Red Army. 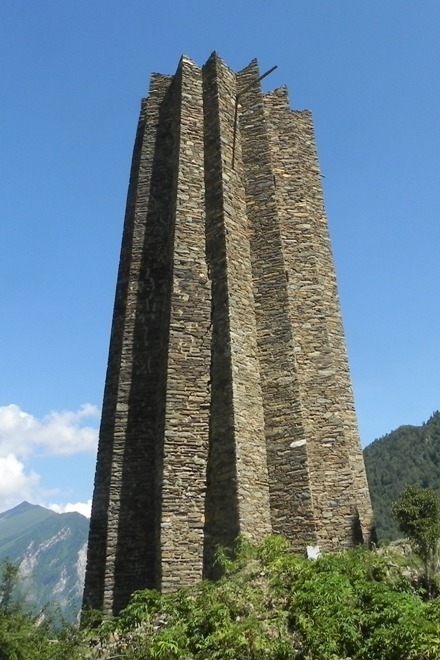 The monument is erected near the county seat of Danba Town and is a stylized version of a fortress tower which blends the features of both the Han and Tibetan people. for concealed observation and defensive fire. 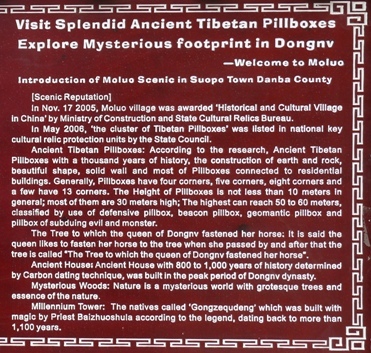 I went back to Danba in August along with a group of good friends who had read about, but never visited, the fortress towers. We started our explorations at the Moluo Scenic Village where the introductory signage is, simply put, meaningful and lovely. It is interesting that the towers are called ‘pillboxes’. The pillbox was a British term introduced during the early days of the Second World War. The pillbox was a small fortification, usually of concrete, designed to slow / stop the enemy as he moved on his axis of advance. They were sited at strategic positions and had a good command of sight and excellent arcs of fire for the machine gun(s) that would be mounted inside. The size of the pillbox varied, but generally they would accommodate three or four soldiers. The British Army designed 12 types of pillboxes and they were placed throughout England in case of invasion. Some remain to this day. There seems little doubt, both historically and intellectually, that a major function of these towers is military. The fortress towers make for excellent observation platforms, superior defensive fighting positions, and a secure place for troops to billet. 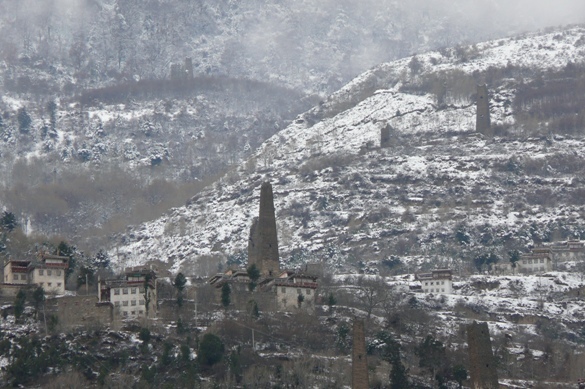 The above photo shows a fortress tower built mainly for military purposes. It is sited with great inter-visibility up and down the Gyalrong Valley. 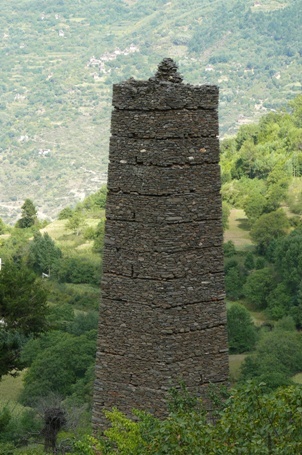 The tower is about 40 meters tall and is very slender or narrow. the two window openings near the top for ventilation and light. But there are other reasons to build and maintain a fortress tower in addition to its military use. Local verbal history recounts that towers were built to display family wealth and influence and power. The towers were constructed on the birth of a son and would be given to him as a secure place to protect all his valuables. He could store his tea, salt, sugar, barley and other grains, as well as some smaller livestock, in the lower level. Additionally, if the local king started warring with a neighbor as was often the case, then the tower was a secure living space for his family in the mid-levels of the tower. And as necessary the top portion of the tower could be used for observation purposes and also as a place to safely let loose with a bow and arrow. Some towers also had arrow slits in the mid-levels of the tower, designed with a narrow opening on the outside but with a broader arc-opening on the inside to enable a larger field of fire against an enemy. up to the door by a winch from the upper window. 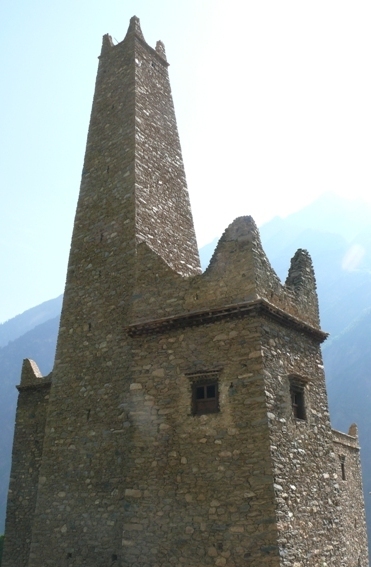 Some towers were single purpose, built for storage or for purely military purposes. Those towers designed for storage were not very tall, had a broad base, and had several large doors near ground level. They lack systematic archery slits but retain some openings at mid and upper levels to provide light and for the movement of air. While these storage towers are not like the silos of North America, the towers are squat, broad, and less elegant than their other neighbor towers. Some towers were true fortress towers and were designed for purely military purposes as shown in the photo below. The effectiveness of the fortress towers is unquestionable, and caused Emperor Qian Long to construct many similar towers in the Western Hills of Beijing to train his troops how to defeat the towers. But in the 1770’s Qian Long decided he needed a better solution, so he deployed Portugese cannon to incapacitate and destroy significant fortress towers. The one shown below received the full wrath of the Chinese cannon gun crew. lowering the barrel to reduce the top of the tower to rubble. 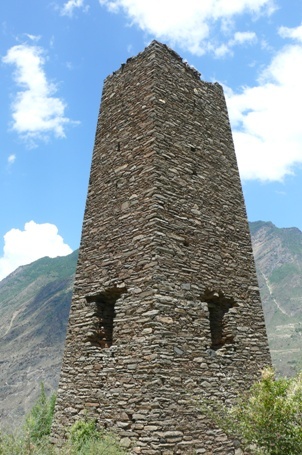 But one of the primary purposes of returning to The Fortress Towers of Danba was to discover the unique and famous 26-sided 13-point tower. And we did! almost 30 meters in height and is 10 meters wide at the base. 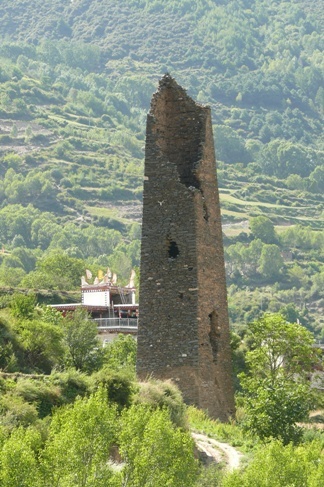 To reach the tower, we drove up a multi-switchback road until it ran out at ZeZhou Village and a lovely Bon monastery named Rong Rou Gompa. From there our guide said that the tower was at the end of an uphill path and would take about 45 minutes to make the journey. 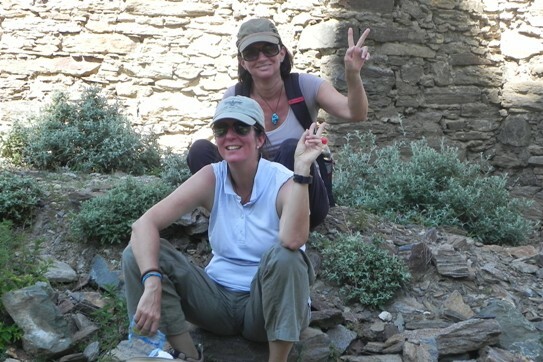 Two members of our group were willing and able (and fit enough at 4,100 meters elevation!) to make the climb. And of course they took cameras and took some fantastic photographs, such as the one shown above. our unique Fortress Tower. Thank you ladies for the great photographs!! And then, all too quickly, we had to leave. It was time to drive to the third highest airport in the world (KangDing – KGT – 4,280 meters / 14,042 feet) and end our excursion. … but we will, indeed must, return again! Frederique Darragon wrote a lovely book The Secret Towers of the Himalayas ISBN 9787807090434, and also produced a Discovery Channel documentary of the same name. 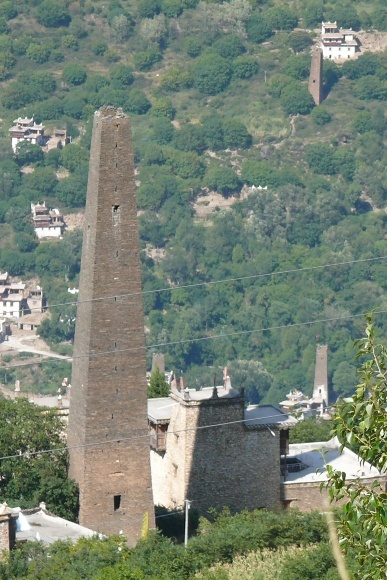 In the book, she displayed a photograph of a remarkably shaped tower which is shown on the right in the photo below. The tower appears to have a rectangular center on each of the four sides, separated by a standard 2-sided single-point column. In this case the tower would have 12 points with 20 sides ! A must visit and see ….